I loved Unspoken beyond all reason. My review is nothing but gushing sentences and stress. 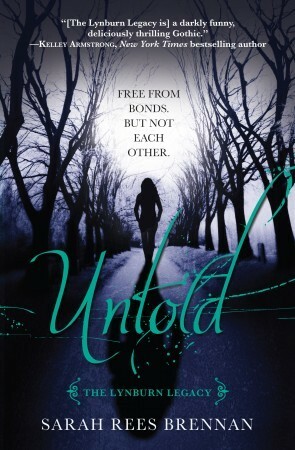 The cliffhanger at the end was a doozey and I don’t know how I managed to wait over a year to read Untold, but I did, and now I’m tasked with scooping up my feels and sorting them in to a coherent review. Untold begins soon after Unspoken ended and Kami and Jared are not speaking, barely tolerating one another and both of them are absolutely miserable. They, along with the rest of the crew, must band together to stop Ash’s father from taking over Sorry-in-the-Vale and reinstituting blood sacrifices. The group spends a lot of time making plans, having planning meetings, training for said plan etc. and that is the reason I was unable to give this book 5 stars. The plot itself is not this books strong suit. There is so much waiting around for a final battle that when the battle does happen I felt rather unimpressed. What this book does well, and what Sarah does well, is characters. I adore Kami who has taken her fledging journalism career in her own hands and is passing out a school paper that the entire town is reading. I love that she is strong, spunky, and despite not having any magical power she is the one actively trying to save the town, it is Kami that the others are following and looking to for direction. Even if Kami is a jumbled mess over Jared. Jared disappointed me a little in this book. I won’t lie I’ve never been firmly in Jared’s corner. The brooding bad boy act is a little old, and while I do want him and Kami to be together his actions make it hard for me to like him. Jared and Kami kept having these ‘two ships passing in the night’ moments and after a while I wanted to shake them both. Say what you mean, and mean what you say! Luckily, Rusty played a much bigger role in this novel and that almost entirely made up for my frustration with Kami and Jared. When I met Sarah at the RT Convention this year she asked me what team I was on and instantly and unabashedly I said “Team Rusty of course!” The guy is a total scene stealer and I liked that he is a little more serious (though still witty and awesome) in this novel. I hope to see even more of him in the next novel. I almost forgot to mention Angela, Holly, and Ash so to quickly recap. Angela was great. I like her nearly as much as her brother. I’ve never really liked Holly so I didn’t like her in this book either. I could rant on about why I dislike her but honestly I don’t have a very good reason, she is just a character I don’t like. I found myself wondering why Kami is friends with her in the first place and I drew a blank. Then Ash, he reminds me of Amelia Pond in Doctor Who, he is the boy who waited; the one who’s done everything right and just wants to be noticed and loved. I feel so sorry for/sympathetic toward Ash I want him to have a happy ending because the guy is trying so damn hard and no one ever seems to notice or give him credit for that. Overall, Untold was a novel I enjoyed. I didn’t like it as much as Unspoken. I felt the plot was a bit repetitive with all the planning and preparations but I was so happy to see the characters again that it was worth the wait. I am now going to suffer through another year of waiting just to read more about these characters and Sorry-in-the-Vale and Rusty, but mostly Rusty. Thanks for the review (love your writing, by the way) and the awesome blog!